As a student at Amherst College in Massachusetts, Steinman wrote the book, music, lyrics and starred in a spectacular play, The Dream Engine. Joseph Papp, founder of the New York Shakespeare Festival, saw the play and was so impressed he went backstage at intermission and bought the rights to The Dream Engine with plans of opening it off-Broadway at the Delacorte Theater in Central Park. Papp's plans were hindered, however, by city officials who advised him that Steinman's material was "far too raunchy, sexually explicit and violent to be performed in an open public place owned by the city." Papp then commissioned Steinman to collaborate with Michael Weller, who wrote the screenplays for Hair and Ragtime. The result was the 1974 premier of More Than You Deserve. It was during the auditions for that musical that Steinman and Meat Loaf first met. Britain's Kerrang! magazine named this meeting as one of the Top 10 most important moments in the history of Rock and Roll. Bat Out Of Hell, which Jim wrote, arranged and co-produced, has sold over 30 million albums since its release in 1977, and has remained on the British Top 150 Album Chart ever since. Internationally Bat Out Of Hell is the biggest debut album of all-time and continues to sell upward of 45 thousand albums every week. It has been called "the soundtrack of a generation" and it continues to function as such every time a teenager discovers the album. In the next few years, as well as writing all of the songs for Meat Loaf's Dead Ringer album, Steinman wrote the all orchestral score for the Rob Cohen directed film A Small Circle Of Friends. In 1981 Jim recorded Bad For Good, his only solo album. He wrote all the songs and co-produced this platinum album with Todd Rundgren. After Bad For Good, Steinman wrote and produced "Total Eclipse Of The Heart" for Bonnie Tyler. The song was #1 in almost every country of the world and won a Grammy in 1984. The album Faster Than The Speed Of Night, was the first album by a female artist to enter the UK charts at #1. At the same time, Jim wrote and produced "Making Love Out Of Nothing At All" for Air Supply. It reached #2 in the Billboard Charts as "Total Eclipse Of The Heart" reached #1. Jim Steinman is the only individual to have written and produced songs that were #1 and #2 simultaneously. The next five years held a number of projects. He wrote and produced "Left In The Dark" for Barbra Streisand. For Barry Manilow he created "Read 'em And Weep," the last top ten single Barry would have. He co-produced Billy Squire's Signs Of Life LP. For the British group Sisters Of Mercy Floodland album, he produced two of the three top 20 UK singles, one of which, "This Corrosion," went to #1. In 1986 he produced and directed Bonnie Tyler's Secret Dreams And Forbidden Fire LP, in addition to writing four of its songs. Its #1 single "Holding Out For A Hero" was featured in the movie Footloose. Steinman also wrote all of the concert music for the Walter Hill film Streets Of Fire. In 1989 Jim wrote and produced Original Sin for his all-girl recording project, Pandora's Box. Critically acclaimed, many of its songs have been subsequently recorded and released by other artists with great success. The title cut was recorded by Taylor Dayne and used as the theme to the movie The Shadow. Bat Out Of Hell II - Back Into Hell, Steinman's reunion collaboration with Meat Loaf, was released in 1993. Dubbed the "come-back album of the decade," it was the fastest selling album since Michael Jackson's Thriller. Featuring the worldwide #1 single "I'd Do Anything For Love (But I Won't Do That), sales top 15 million copies. The UK group Take That takes the Steinman produced "Never Forget" to #1 in 1995. For Celine Dion's Falling Into You album Steinman produces three tracks and penned her smash hit "It's All Coming Back To Me Now." The 1996/1997 theater seasons welcome the premiere of Whistle Down The Wind. Jim provides lyrics for this Andrew Lloyd Webber musical. Steinman will also be providing the music for Roman Polanski's Dance Of The Vampires which is scheduled to premiere in Vienna in the fall of 1997. What could possibly be the most exciting project of Steinman career is also in development. Work on Neverland, Jim's dream project, is underway with both stage and screen being discussed as forums. Jim Steinman was one of the first to appreciate the power of images with music. He has always had the general attitude of his songs being theater pieces, mini-operas. Steinman's artistic contributions have been varied and plentiful and there is every good reason to believe his future holds much more of the same. 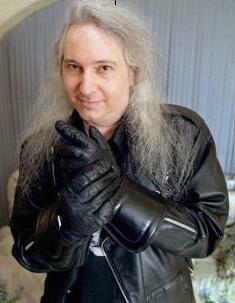 Behold the wonderment that is Jim Steinman!